"The only thing I wanted to achieve was to give the listener a feeling of despair. I am not interested in melody, nor in radiofriendliness. There is no thought, no theory behind my music. My mind is completely empty while composing. I do not care for people, in general. In fact, I hate people. Mankind is dumb and ignorant. And I shall be at the forefront, striking you with my flaming sword, when your downfall will come. We have enough of your stupidity. So speaks Palmer Eldritch, destroyer of worlds." An enigma indeed. The only hint we're going to give is that you can learn more about Palmer by consulting your favorite search engine. But will you really learn anything concrete that way? Probably not. 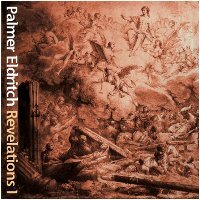 Fortunately, there is nothing left to the imagination with Palmer's debut release on Earth Mantra, entitled Revelations I. Put simply, this is some of the coolest and most spine tingling dark ambient we've heard in awhile. Indeed, we couldn't be prouder to bring this beautiful-if-somewhat-scarey release to our listeners. Enjoy - just don't listen with the lights off. The Three Stigmata of... As a huge Dickhead, I got a very big kick out of your name. It's actually my favorite PKD novel.